Join Us!!! We are looking for someone to help us cover Libyan women basketball. Please send us an e-mail. Nasr have won Libyan Basketball Cup beating Al Ittihad in the Final game. They posted a 60-55 win to seal the trophy. Nasr won the first period 13-7, while the opponents replied with a 15-12 rally in the second frame. Nasr however posted two victories in the second half to win the game. Earlier the teams became the winners of the Preliminary Rounds in their groups. Al Yarmook (D1) added to their roster 22-year old Serbian center Pavle Cvetinovic (215-110kg-97). He just played at Vllaznia in Albanian Superliga. Cvetinovic also played for Isa Town (Premier League) in Bahrain league where in two Superliga games he recorded 5.5ppg, 7.0rpg, 1.0spg and 1.5bpg this season. He played in the final of Serbian U19 Championships in 2014. Cvetinovic has played also professionally in Slovenia (Elektra), Serbia (Metalac and Crvena Zvezda) and North Macedonia (Pelister Bitola). 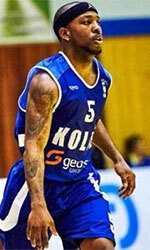 Al Alhy Benghazi (D1) signed 29-year old American point guard Jawan Davis (184-83kg-89, college: Claflin). He started the season at Politekhnik in Ukrainian Superleague. In 26 games he had 13.5ppg, 3.8rpg, 4.2apg and 1.7spg this season. The last summer Davis played at Ostioneros de Guaymas (CIBACOPA) in Mexican league where in 8 games he recorded 13.1ppg, 2.6rpg and 5.1apg. The list of the past achievements is quite long as among others his team made it to the Egypt Superleague Cup Final Four in 2015. 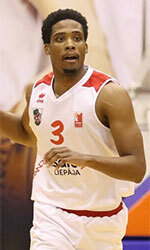 Davis was also voted Eurobasket.com All-Cyprus North League Shooting Guard of the Year back in 2014. He is quite experienced player. Davis has played in nine different countries on five different continents (Europe, Asia, Latin America, Africa and of course North America). He has played previously professionally in France, Hungary (Marso Nyiregyhazi KK), Montenegro (Ibar Rozaje), Morocco (FUS Rabat), Qatar (Al Khor), Serbia (KK Napredak Rubin Krusevac), Czech Republic (BK Kolin), Cyprus (Koopspor) and Egypt (Al Ittisalat). Davis attended Claflin University until 2011 and it is his eighth season as a professional player. He could be described: Jawan is a tough natural Leader PG with high basketball IQ making him a great floor general. He has blazing speed/quickness making him always an offensive threat and is known for being a defensive stopper. On offense he uses speed for change of direction, mismatches for slower players to create any shot, and puts pressure on defense with fast break situations. On defense he uses this to harass players, be pesky getting numerous steals & disrupting offense with full court pressure every play. Shoots the 3 really well from any situation and is great with making plays from pick and roll. Mid range is his best game. Plays with passion and heart while being a true professional with work ethic every day. The most exciting game was a derby match between two local teams from Tripoli: Ahly Tripoli (#1) and Al Wahda (#6). Ahly Tripoli (12-1) crushed visiting Al Wahda (0-11) by 104 points 126-22. Ahly Tripoli maintains first place in Group A with 12-1 record. Al Wahda at the other side still closes the standings with 11 games lost. Another exciting game was again a derby between two teams from Benghazi: Al Nasr (#1) and Al Hilal (#4). Al Nasr (15-0) crushed visiting Al Hilal (6-8) by 42 points 87-45. Undefeated Al Nasr have an impressive series of fifteen victories in a row. Defending champion maintains first place in Group B with 15-0 record. Al Hilal at the other side keeps the fourth position with eight games lost. Another exciting game was again a derby match of two local teams from Benghazi: Ahly Benghazi (#3) and Al Tahaddi (#6). Al Tahaddi was crushed at home by 72 points 46-118 and even the advantage of their own court did not help. Ahly Benghazi maintains third place in Group B with 8-6 record having three points less than leader Ahly Tripoli. Al Tahaddi lost their twelfth game in a row. They still close the standings with 14 games lost. In the last game of round 15 In Group B KBW was crushed by Morog in Almarj 103-44. Another exciting game was again a derby between two teams from Benghazi: Al Nasr (#1) and Al Hilal (#4). Al Nasr (15-0) crushed visiting Al Hilal (6-8) by 42 points 87-45. Al Nasr have an impressive series of fifteen victories in a row. Defending champion maintains first place in Group B with 15-0 record. Al Hilal at the other side keeps the fourth position with eight games lost. There was no surprise in Almarj where 5th ranked KBW (2-12) was crushed by second ranked Morog (12-3) 103-44 on Friday. The victory was the third consecutive win for Morog. They maintain second place in Group B with 12-3 record having just two point less than leader Ahly Tripoli. KBW lost their seventh game in a row. Newly promoted team keeps the fifth position with 12 games lost.